The software applies careful algorithms for source analysis and powerful search and recovery mechanisms similar to those used in professional series, yet, it does not require special technical knowledge or skills. Raise Data Recovery includes software versions for all file systems types of Windows, Linux and Mac. The software automatically selects data recovery methods for the purposes of your operating system and conveniently recovers lost information from your computer. The style interface makes software use intuitively clear. Moreover, Raise Data Recovery gives you tips and guides in the total process of data recovery making the process quick and effortless. Raise Data Recovery is assigned for data recovery from Windows, Linux and Mac file systems (such as NTFS, FAT, ExFAT, HFS+, Ext2, Ext3, Ex4, ReiserFS, JFS, XFS, UFS, UFS2 etc.) and raw recovery technique. The software automatically selects data recovery methods for the purposes of your operating system and conveniently recovers lost information from your computer. Raise Data Recovery applies careful algorithms for source analysis and powerful search and recovery mechanisms similar to those used in professional series. At the same time, it does not require special technical knowledge or skills. 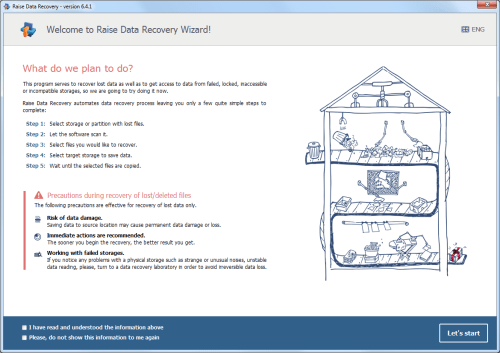 Raise Data Recovery is a top-level software wrapped in a simple and intuitive wizard-style interface. The software doesn't require any extra user actions to start the process of data recovery. After simple clicking the button for storage scan, the program runs over the storage space delivering all found folders and the intact files contained inside the file system. 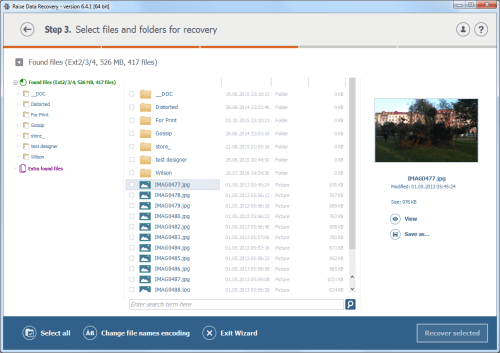 Raise Data Recovery helps to get the deleted files back after an accidental pressing of the Shift-Delete button or file deletion from the recycle bin. Besides, it has the power to retrieve lost information in more complicated situations including virus attacks or software malfunctions, system failures or even logical failures aggravated by hardware damages. - 50% discount for Long Term Support period renewal. For data recovery from Linux, XFS, macOS or RAID additional Licenses are needed. 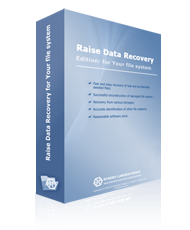 Each Raise Data Recovery product can recognize all file systems supported by UFS Explorer, however, files access and files recovery work for specific file systems only. Thus, make sure you use the right software edition before purchasing software license. full support: data access, search for lost partitions, deleted files recovery, recovery after formatting and recovery after file system damage. full support: data access, search for lost partitions, RAID recovery, deleted files recovery, recovery after formatting and recovery after file system damage. Support of NAS devices and custom servers. full support: data access, search for lost partitions, RAID recovery, deleted files recovery and recovery after file system damage. full support: data access, search for lost partitions, RAID recovery, deleted files recovery, recovery after file system damage. Supporting both NAS and custom servers. full support: data access, search for lost partitions, RAID recovery, deleted files recovery, recovery after formatting and recovery after file system damage. 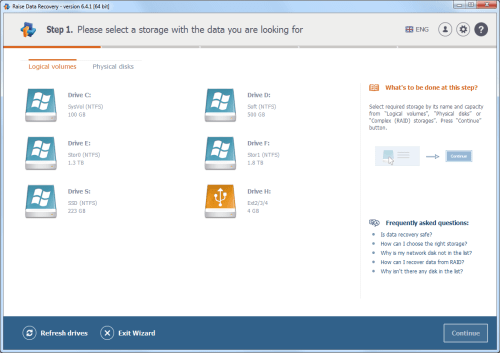 data access, search for lost partitions, RAID recovery, limited deleted files recovery and recovery after file system damage. NEVER download or install the software to the storage you lost your information on. In most cases this causes permanent data loss. If you lost your information from system partition, it's strongly recommended to shut down your system and consider using UFS Explorer Emergency Recovery CD.